Lausanne, Switzerland, February 2, 2016 – The FIVB Sports Events Council meeting in Lausanne on Monday and Tuesday confirmed the hosts for four of the six Age Group World Championships which will take place between June and August 2017. The Council also decided to submit recommendations to the FIVB Board of Administration to reduce the number of teams participating in the U18 Girls’ and U19 Boys’ World Championships from 20 to 16 and to organise the U23 Men's and U23 Women's World Championships over eight to ten days. The 2017 edition of the Girls’ U18 World Championship will be hosted by Argentina, who also welcomed the Boys’ U19 World Championship in 2015 in Resistencia Chaco and Corrientes. Host cities were nominated for three Age Group World Championships. The cities of Boca del Rio and Cordoba in Mexico will host the U20 Women’s World Championship in 2017. The U21 Men’s World Championship was awarded to South-Moravia and the city of Brno in the Czech Republic, while Ljubljana and Maribor in Slovenia will prepare to welcome the U23 Women’s World Championship in 2017. The hosts of the 2017 U19 Boys' and U23 Men's World Championships will be confirmed in due course. Twenty teams compete in the current formats of the U18 Girls’ and U19 Boys’ World Championships, but the Council will recommend lowering this number to 16, in line with the number of teams which participate in the U20 Women’s and U21 Men’s competitions. The U23 Women’s and Men’s competitions will continue to feature 12 teams each. 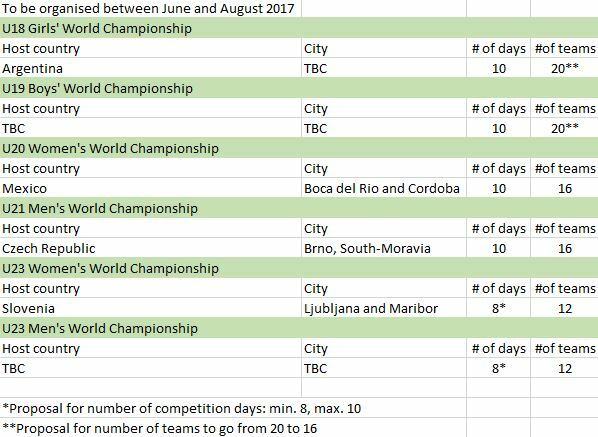 Finally, the U18 Girls’, U19 Boys’, U20 Women’s and U21 Men’s competitions are all scheduled to take place over 10 days. For the U23 Women’s and Men’s competitions, the Council will recommend a minimum duration of eight days and a maximum duration of ten days.